We know that, as individuals, we each learn a little bit differently than the next person. Some people learn best by seeing, some by hearing, and others by doing. How we navigate and use our computers is no different. Some users prefer the text menus at the top of a program’s window (File, Edit, View, and so on). Others prefer the tool bars with icons for the functions (the disk icon for “save,” the printer icon for “print,” and so on). And many users prefer keyboard shortcuts (ctrl-c for “copy,” ctrl-v for “paste,” ctrl-x for “cut,” and so on). You get the idea. We’ve got options. One of those options is the right-click menu. To take advantage of the all-powerful right-click menu, you need a mouse with a right-click button (that’s the one on the right). It’s hard to find a mouse lately without two buttons, so you probably have a right-click button. Most laptops have a right-click button also. This article will focus on Windows XP, but most of the menu options are consistent regardless of operating system. 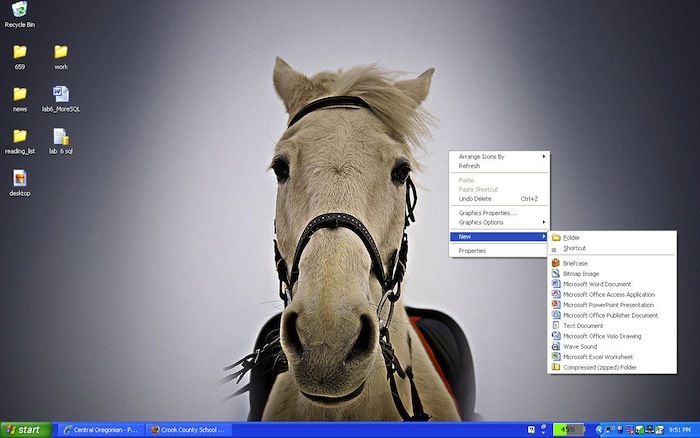 Find an empty space on your computer desktop and right-click. The menu that appears has options for arranging icons; adding new folders and documents; and properties. The two that I use the most are the new folder option and the properties panel, which allows me to change my screen resolution and screensavers without having to crawl through the full control panel. If you have documents or files on the desktop, you can right-click on them too. For most files, a right-click displays a menu with options for opening the file; copying and deleting; and sending the file to another location. The two best features hidden in this menu are the “send to” (great for sending a photo in email with one click) and the “open with” options. 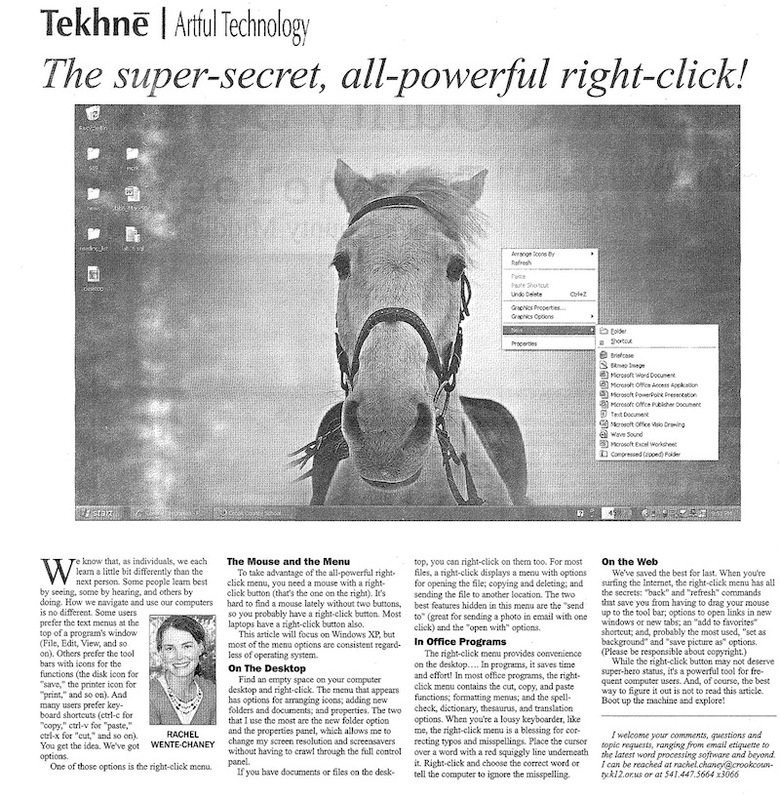 The right-click menu provides convenience on the desktop…. In programs, it saves time and effort! In most office programs, the right-click menu contains the cut, copy, and paste functions; formatting menus; and the spell-check, dictionary, thesaurus, and translation options. When you’re a lousy keyboarder, like me, the right-click menu is a blessing for correcting typos and misspellings. Place the cursor over a word with a red squiggly line underneath it. Right-click and choose the correct word or tell the computer to ignore the misspelling. While the right-click button may not deserve super-hero status, it’s a powerful tool for frequent computer users. And, of course, the best way to figure it out is not to read this article. Boot up the machine and explore!